Every year brings with it good times and not so good times, as well as the natural ebbs and flows of business. What business experience/breakthrough/lesson are you most thankful for this year, and what made it a blessing for you? It was wonderfully inspiring to hear from our panel this week. I wish to add how thankful I have been this year for each and every contributor, who has added great value to this series time and time again — you ROCK! The point is to be thankful for the small and great experiences, connections, challenges, and failures all the same throughout the year. Every moment has value depending on how you decide to look at it. If you need a shift in your perspective on life and business, you will find models to follow in the 36 fantastic attitudes of abundance shared this week. Enjoy! 1. Doing What I Love! In April, I realized I was working at a place that made me physically feel sick whenever I’d leave for work in the morning. Sundays were dreaded because I knew the next day was Monday. After taking a good look at myself, I realized this was definitely not the way to live. And I quit. I did not have another job, but had enough faith in my abilities to find one that I decided it was time to go. And guess what? I worked hard and found one in only 30 days! I am now loving my job, and have yet to look back at that huge decision to face uncertainty and quit in order to find what I’m passionate about it and live my dream. Every year I anticipate with such excitement my professional trade associations’ annual conferences. Not for the wonderful offerings of educational workshops, nor for the dynamic speakers or fun product offerings, and not even for the blissful time away from home. What I look forward to is the time and connection with other professional organizers. I am simply blessed to be part of an association filled with like-minded individuals willing to educate, cheer, motivate, listen and support at a moment’s notice. For me, that camaraderie is on display in all of its finest at conference. The level of sharing of information, exchange of ideas and connections made that go on during conference is unmatchable. Simply put? My business would not be where it is today if I did not attend. 3. Before You Can Get Your Money Right, Get Your Mind Right! I’m so thankful for all of the mentors and coaches that I have hired, followed and watched this year. I have truly been blessed to have met some amazing women entrepreneurs and menpreneurs as well. I must say that my most valuable breakthrough came when I hired my life coach and she had me to strip away all of the hurt and un-necessary baggage that I was carrying around with me. Once eliminating that, I was able to clearly see things for what they really were with my business, personal and spiritual life. I always say that when you are in business, there is one thing that i know for sure is that if you want to get your money right, then you must also get your mind right. They work hand in hand when it comes to how successful your business or personal life will be. I am blessed to work with some of the smartest, savviest, most successful, visionary coaches, authors and speakers on the planet and many of you struggle with your web copy (marketing message) and website in general. I LOVE what I do. Writing comes naturally to me and so does strategic thinking (two elements that are vital to online success). BUT the reason I do what I do is to give women a voice to turn ideas into something that matters. I do this by writing copy for websites (and beyond) that builds relationships, gets clients and makes money. I’m passionate about this because it makes a difference and I feel really good about helping others succeed. By gaining clarity about my “WHY”, I’m able to clearly articulate the value in what I do and feel GREAT about my mission. Often we are too close to our businesses and it helps to get new perspective. I believe that you have a BIG mission and message but you may be struggling to articulate it. Maybe your website doesn’t truly reflect your essence and it’s time that you get some fresh perspective. Or maybe you just need to step back and look and your “WHY” and the rest will follow? Sometimes the repetitive mundane tasks are the ones that keep us afloat. It might seem like these tasks are the ones that hinder your productivity. But you might just find that these are really the ones that keep you focused and keep your business going. Like in the Karate Kid, Daniel might have been waxing cars all day, but at the end of the day that repetitive task led to a bigger picture. 6. The Biggest Blessing Has Been Our Affiliate Juice! For 2011, our best experience has come through our rapidly growing affiliate program. Earlier this year, we went to the Affiliate Summit East with a pass that was given to our company as a gift. We relished every second of that event and made dozens of new connections. Soon after, our affiliate program took off like wildfire. This year, we were featured in two articles in FeedFront Magazine and were given three gold passes for the Affiliate Summit West to giveaway. We are currently running a Facebook giveaway for our affiliates with those tickets being the prizes. As a result, we’re getting a ton of new interest in our program and website, and that’s a blessing. Our greatest experience was learning from last year’s Black Friday sales. We were trying to compete with the actual in-store sales and we couldn’t generate enough online sales on Black Friday to compete with the in-store craziness. But this year, knowing that consumers will be price shopping with their mobile devices, retailers are planning to put many more items on sale online during Black Friday. For us, that is fantastic news because we utilize those larger retailers’ affiliate programs to make commission during those hectic holiday shopping days. We have the experience from last year and we are using that to our advantage this time around. 8. Which Hat Does Your Turkey Wear? In a startup you wear many hats and I love fashion, so yes, I will gladly take on that role! One person, however, cannot do all things, so that being said I have to say I am incredibly thankful this year that my sister is a graphic designer and so talented, because frankly I gave it the ole college try, and let’s just say I have a new appreciation for her – I am thankful she is a graphic guru, works for us and is my one and only sister! The business experience that I am most grateful for this year is really understanding, acknowledging and taking action on the importance of clarity in your business. Clarity in where you are today and therefore what you can offer. Clarity in where you are going. Clarity in who are you serving and how. Clarity in how are you going to get to where you want to go step by step (with the ability to be flexible when needed). There is so much power in being crystal clear in what you are doing and why you are doing it and then being clear on as much of the details of it as you can be (ie: your marketing, your finances, your audience, etc.). When you are very clear, you can make smart choices that will help elevate you to serve the greatest number of people and build the best business possible. It took some major theory and reading to learn how to integrate Facebook, Twitter, LinkedIn, YouTube and others in easy steps using umbrella services like Hootsuite or Sprout Social. Socializing can be tough to keep in front of without useful tools and data. The breakthrough happened for us when we realized our reach was more about engaging with others than putting our message on the Internet. @Mentions and @Posts on friendly follower walls is the reason social media is called social -engaging two-way communications. The aha moment happened when we realized it’s not the number of friends or followers – but the number of views that measures your reach, and you know you’re making an impact when others are talking. This year I read an article by Amber Singleton Riviere re: Accountability and Planning. Amber has written several articles on the topic and it motivated me to start my own A&P partnership with a valued colleague that is equally committed to growing her business. Meeting monthly with my partner, we help each other move our visions forward, and in turn, we have both been reaching our goals more quickly. Thank you Amber for the inspiration! Thank you Lydia for being a great A&P Partner! Here’s to crossing more goals off our lists in 2012! The number one thing that I am taking away from 2011 is being consistent in my marketing strategies for my business. Having a monthly newsletter has kept me in front of my target market. Regularly sending out the newsletter the same time each month has increase sales. The biggest business life lesson this year has been to focus on building an experience for my customers rather than “trying” to make a sale. It’s NOT about product and pricing. It is about how my product/service changes my customer’s life. That’s priceless. 14. It Started In The Sweat Lodge! After a severe breakdown to my ego, my intended direction and life; I reached out to many acquaintances while I was in California. I met Marie in Ibiza two years prior in a seminar and hardly knew her. It took her two months to call me back because of some issues with her mother. She did, we met, we sat in an infrared spa for 30 minutes, sweated and connected. We created a project and talked everyday since. This partnership became my lifeline, my mentor in the game of life. I really get to see what a deep connection brings to a project and business; ease, understanding, flow, magic, playfulness, prosperity and love. The power in this connection also comes from being aligned in a discipline we both learned and we use that discipline daily. Improvisational Dialogue! 15. Twitter – The Cyber Cocktail Party! In 2011, I am most thankful that I put my scepticism aside and jumped into the cyber cocktail party, known as Twitter! After years of doubt, I finally got trained in the benefits of Twitter for small business. I learned the etiquette and the ins & outs of Twitter (and there are a lot of them!) Twitter is a very powerful marketing tool and the exposure for a product or service is endless. I know that Twitter has been great for business because I have connected with my target markets – moms, power bloggers and media! Done correctly, Twitter is an amazing force but it is key to remember to engage, listen, respond, provide great content and most importantly, don’t spend the whole party talking about yourself! As a 2010 graduate, I am fortunate and downright lucky to have a job in this market, and with my (lack of) professional experience. Despite the fact that I am grateful beyond belief, I see many of my peers in similar positions treat their job as something they were entitled to receive. We are all entry-level at this point, but they treat some job tasks as menial, or below them. I find this appalling–while I don’t want to be a Pollyanna figure, I find that everything I’ve done at work has given me a chance to grow. I never knew that picking up copies of brochures one day would mean I’d be able to exhibit for my company at a conference. Basically, I’m grateful I escaped the curse that afflicts so many people in my generation–the inability to appreciate the value of hard work. 17. Inspirational Stories That Motivate Moms – Thanks! As a shoestring start-up, we have learned over the past year the meaning of quality versus quantity. I realized that it’s not about how many clients we get, but the quality of service and work we provide for the clients we have. Through giving value and being dedicated to putting in all that we can to each project – treating each client’s company as if it were our own – the quantity part comes naturally through referrals and word-of-mouth marketing. So, I’m thankful for the wonderful entrepreneurs we have worked with over the last year; each is so inspirational with their drive and ambition to make it happen. As much as we help them, they also help us by showing how hard work truly pays off. So thank you to our clients and we look forward to an abundant 2012! This year, our breakthrough experience was our growth with our social media following. Just on Facebook alone, we grew from zero page followers to almost 6,000 in a just a few short months. Also, our Twitter following has steadily grown as well. Since our website only launched several months ago, we are exceptionally happy with the growth. Our rapid growth rate comes from our megaprize giveaways and our constant conversations via Facebook and Twitter statuses, questions, and comments. It’s a rewarding experience to be able to thrive during such a rough economic time for businesses, and for that, we really feel blessed. My rhyme of the Sandburg line is my expression of gratitude. Gratitude for all the people/places willing to pay for my opinion. Call me a late-bloomer if you will, but a year ago, I didn’t know the extent of online opportunities out there for freelance writers. Admittedly, I’m still on “little cat feet,” as opposed to leonine strides in the blogojungle, but I’m enjoying the process and determined to acquire even more e-accounts in 2012. Our blessing in disguise has been the state of the economy. This past year has been a rough one for many people who are struggling to keep their heads above water financially. With our website, we provide direct links to government auctions that have helped countless amounts of people obtain items that they need for well under market value. Even though people rarely wanted to spend money on items at all, they still needed an outlet for discounts. We were there for them and provided them with the help they needed. People got vehicles so that they can take their kids to school. Others purchased a laptop so they could complete their college studies. 22. Moving In And Moving On! Since the economy has been stuck on the ground floor, people who have saved enough money can get fantastic deals on properties, rates on mortgages and 3.5% down payment FHA loans (on which the limit was just raised again). This year, our greatest experience was being able to help so many people find a discounted home to start their new family. Currently, the finance rates are so low that people are very interested in finding a foreclosed property that they can buy. Our site deals with providing people with the info to find a lovely home, obtain an unbelievable mortgage rate, and even secure a FHA loan with a super low down payment. At the close of each year, I put the Pareto Principle (a.k.a. The 80:20 Rule) to work to see which 20% of the people in my database have helped create 80% of the results in my business (and life). It’s not just about thanking clients for their business; it’s about acknowledging the extraordinary and generous people who came through for me in all kinds of ways this past year. For example: the mentor who gave me spot-on, beautifully timed advice that helped me make a big decision with greater confidence; the colleague who referred me to an amazing client that bolstered my bottom line; the suppliers and vendors who came through in a pinch to help me achieve notable results on a crazy deadline; and even the friends who listen to me vent over coffee or cocktails. The main lesson I learned this year is the minimum viable product from the Lean Startup. I would sit with product ideas and spend weeks thinking what the consumer wants. When I’d finally release the product, I’d find I wasted a lot of time. So instead I now create minimum viable products that I ship often and test with customers and constantly improve. 26. Breakdown Or Breakthrough–It’s Your Choice! One such “friend” took me to small claims court this year. Fortunately, the magistrate was sharp and carefully considered all the evidence. The case was settled equitably and no judgment was entered against me. However, this situation could have been avoided had I insisted on better written contracts. Now I have updated all my contracts and made sure they are bullet- and “friend”-proof. When I worked in the corporate world, networking was basically done between departments with the goal of using it in the hopes of moving up the “food chain” of the company. It was something that I learned to have a love/hate relationship with. Amazing how the views have changed after 7 years detached from the corporate world. In the past 2 years since I started my business, I have been very thankful to connect and network with some great people who have helped me foster ideas that I have been applying to my business ever since. I look forward to continue growing these connections in 2012. I co-own a business making outdoor recreation maps. Rather than going into debt, my partner and I have spent the last few years working full-time for ourselves in the summer and working other jobs during the winter while we work for our business on the side. It’s given me time to ease into the idea of being self-employed and build some connections in the community as I go. This year I couldn’t find a job, not even a part-time service industry job. It was discouraging and scary at first but it’s forced me to throw myself into the business and try to make it work as a year-round venture (which has always been the goal anyway). We’ve stepped up the timeline for our next maps and we’re envisioning several projects which we probably wouldn’t have dreamed of if I’d been working another job. Instead of trying to be all things to all people, I really focused on being true to myself and my brand image–even though that image may be a little unorthodox. I stopped wondering “What will people think?” and I repositioned my brand just enough to let the true essence of my personality and my brand image show through. The result? I am more satisfied with my business, I am attracting clients I enjoy working with who were attracted to my unique image and I will end the year with triple my revenue over last year. Takeaway: Be true to yourself and your brand and your business will grow. This was actually my first year in business- so I’m really excited about all that I have learned. I thought about sharing that I finally know my worth (expression snagged from the DailyWorth), but decided that the concept of collaboration is not touched on enough in business tip pieces. Entrepreneurs and professionals alike fear getting to know their competition on a collaborative level. However, for me, it has been invaluable to have a confidant out there who knows me and who knows my field. If I have a work-related issue or conundrum, it is extraordinarily helpful to tell someone who actually understands (you know, aside from Mom). 🙂 I say it is only *sometimes *the answer to competition because you must always be careful of who you trust and how much you disclose. I’m most thankful for our recognition from the Stevie Awards as Women in Business Best Overall Business of the Year. We work so hard as a team and we have planned and stayed on track this entire year in spite of the rough economy. The fact that we help small businesses by incorporating and forming LLCs at a price new entrepreneurs can afford is so rewarding, but even more rewarding is being recognized by our peers as the Business of the Year. We only earned this reward because we stayed focused and didn’t veer from our goal to develop a comprehensive set of tools that serve small business. We were successful at that goal, and have set even more for the upcoming year. For that, I am so grateful! This year was all about getting as far away from my business that I could. Hear me out, I want to build my business, add more value and be available to more people. I can’t do that being a grunt monkey IN my business! Ain’t that why I stopped jobbing? Anyhow, developing a system that lets my products earn while I grow my business frees my leg from the chain. I can move around now, make more connections and be more for my business than I ever could. That’s what I’m thankful for in 2011, what’ll 2012 bring? Growth! 33. Pick Up The Phone! Running a consulting firm can be feast or famine. When business is good you can ignore marketing. After 17 years I fell into that trap. 2011 started great. I was over-confident. Then reality set in. My biggest clients canceled in June. With no revenue in sight, I melted down for a couple of days. I knew I had to go back to basics. I made a Platinum Pipeline Plan of best contacts, former clients, and referrals. I started dialing and setting meetings. It took a while but each call gave me more energy. I enjoyed each day’s calls and meetings. I’m back in business, more focused than ever. Imagine that? No fancy investments, just building on relationships and offering value. The blessing? Building relationships over the decades has been the key. It’s up to me to keep up the momentum. Thanks to Rebecca Staton-Reinstein of Advantage Leadership, Inc.
I’m most thankful for the opportunity to provide alternative financing options to my customers. We had a client come in with his business in shambles. There was no way we’d be able to loan money to him for his business. However, he had a ranch that was paid for and we were able to offer him a loan on the ranch where he could turn around and invest the money in his business. Today, the company is back on track and he’s one of our best customers. The lesson here is to always think outside the box, or better yet, forget there was a box to begin with! I’ve been looking for a way to talk about what I do (branding) for years. I had high expectations to meet. I wanted the framework I developed to be unique, interesting, give a relatable metaphor that many people would have experienced, be able to be turned into stories, be personal, and to be fun. And the list goes on and on. Having this framework has changed everything in my business and I am SO grateful. 36. Thankful For An Alarming Fire! I am most thankful for a fire we had at our office in September. As many would have tried to avoid it, I was thankful for the lessons it taught me. The fire showed us where our company was weak and needed improvement. It was an event that brought the team together and built us as a company. We are now running things more efficiently, effectively and making large improvements to our operations because of it. 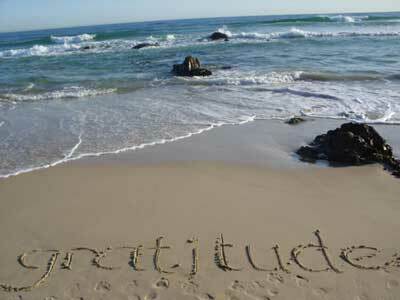 Thanks so much again to all our wonderful contributors for sharing your attitudes of abundance! We hope to hear from you again. And to all our readers, if you have an innovative idea to share, we hope you will leave it in the comments below. This entry was written by Dr. Shannon Reece, posted on November 28, 2011 at 6:00 am, filed under Question of the Week and tagged abundance, blessings, business achievements, positive attitude, question of the week, small business tips. Bookmark the permalink. Follow any comments here with the RSS feed for this post. Post a comment or leave a trackback: Trackback URL.